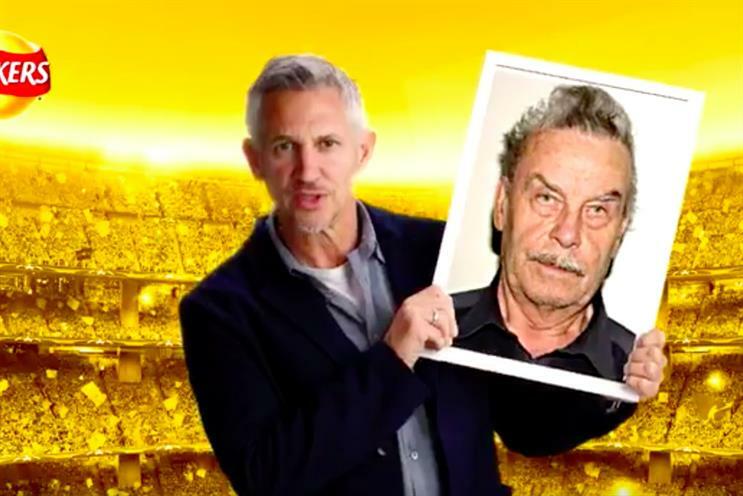 A social campaign by Walkers Crisps asking fans to submit selfies which are then inserted into a video with ambassador Gary Lineker has gone awry, with several Twitter users sending in photos of notorious criminals. UPDATE: Walkers has now apologised and promised to "shut down" the offensive activity. See statement at end of story. The brand is running a multi-channel campaign ahead of the final of the UEFA Champions League, which takes place this weekend in Cardiff, with support from a variety of its agencies, including deVries SLAM PR. 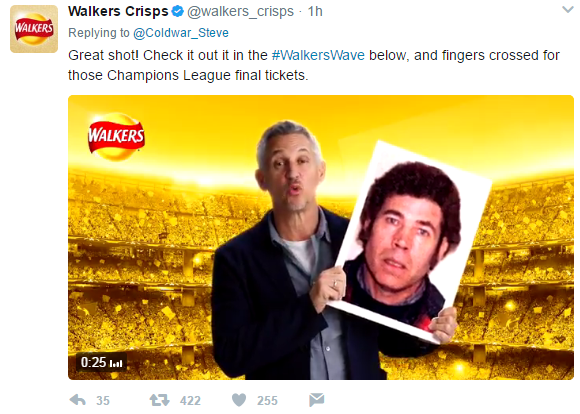 This includes a Twitter competition in which users tweeting a picture of themselves with the hashtag #WalkersWave have their image automatically put into a video of Lineker congratulating them on "uniting with other fans". A number of Twitter users have submitted images of criminals including Harold Shipman, Rolf Harris and Fred West (below). Jailed former footballer Adam Johnson has also featured. Other less unsavoury celebrities, such as former US vice president Joe Biden and ex-footballer Emile Heskey, also feature. Some of the tweets have been retweeted hundreds of times, and the hashtag #WalkersWave was trending in the UK on Thursday afternoon. 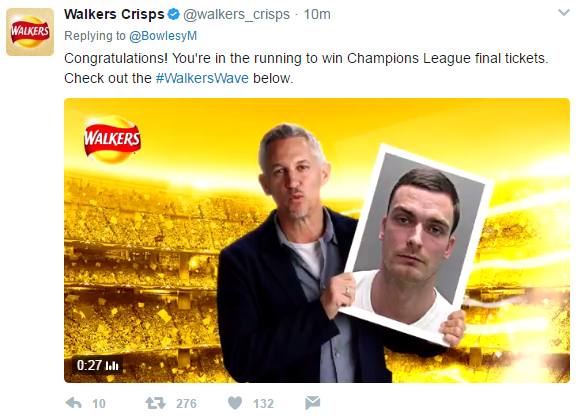 Walkers has now deleted some of the tweets in question. 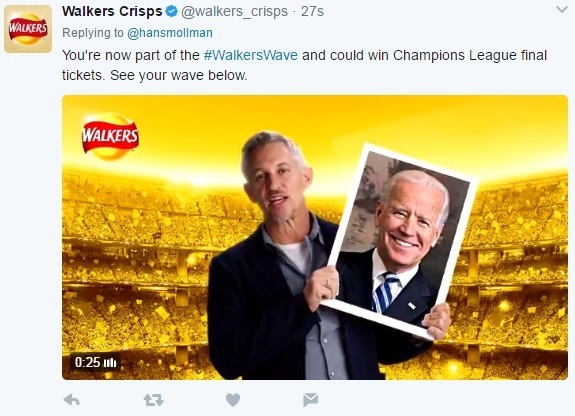 #walkerswave Perfect example of a campaign that assumed people would behave sensibly, despite overwhelming evidence to the contrary. #WalkersWave how did no one see this backfiring???????????? PRWeek has approached deVries SLAM, which won a new consumer comms brief with Walkers owner PepsiCo last year, for comment. It is not clear whether deVries or any other agency ran the Twitter compeition." After publication of this story, a spokeswoman for Walkers sent the following statement: "We recognise people were offended by irresponsible and offensive posts by individuals, and we apologise. We are equally upset and have shut down all activity. "We are sorry we had to close the promotion early. All valid entries submitted have been placed into a prize draw. The winners will be contacted directly." Had an unusual day in some very strange company. I'm sure we'll wave goodbye to them all by tomorrow. This article first appeared on PRWeek. What's the role for social automation after #WalkersWave and #Instafraud?